← Activity Theory: fundamentally humanist or anti-humanist? I use Google Maps almost everyday and it greatly impacts my everyday life. Although the main motivation of using Google Map (or any form of map) is almost always the same, which is to get to my destination, Google Maps in particular can help me achieve different goals in different conditions. 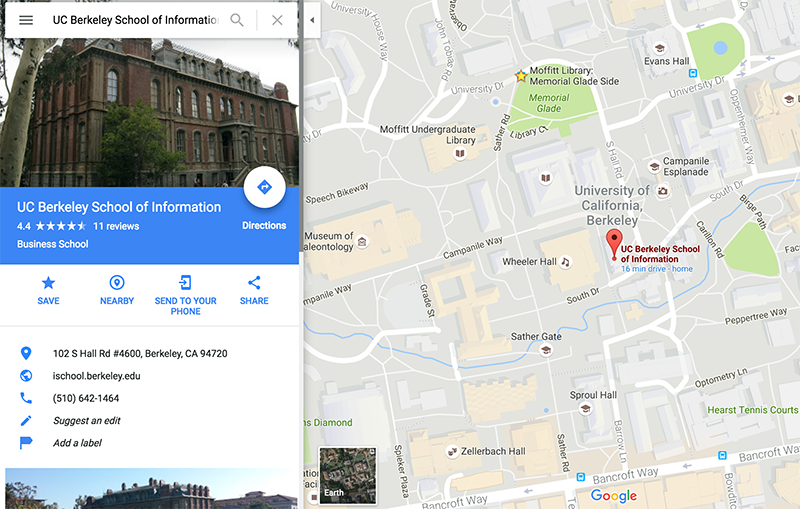 When I first came to Berkeley, I needed to use Google Maps as a navigation tool to get me to school. At first, I followed its audio instructions step by step to make turns. After a few days, I’ve remembered the turns and internalized the process in my head. I don’t have to use Google Maps to get to school, but I still turn it on in rush hours to avoid traffics. Google Maps tells me which roads are busy and which are not, and I can optimize my route accordingly. 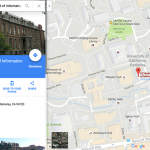 Google Maps can also be customized to avoid toll roads or highways to meet special needs. A few days ago, I got a flat tire and I had to use my spare tire for a few days. I was not supposed to drive faster than 35 MPH using my spare tire, and I had to adjust the setting in Google Maps to avoid highways. Last but not least, the search nearby function in Google Maps is a perfect tool for searching nearby places such as restaurants or gas stations.